I love this for yeast fighting. We use it together with candidase. Love everything from enzyemedic. Trying to get rid of the candida on my skin. This has helped me a great deal in winning the battle of Candida. I take this together with Serrazyme morning and night on an empty stomach. I then dont eat for at least an hour. 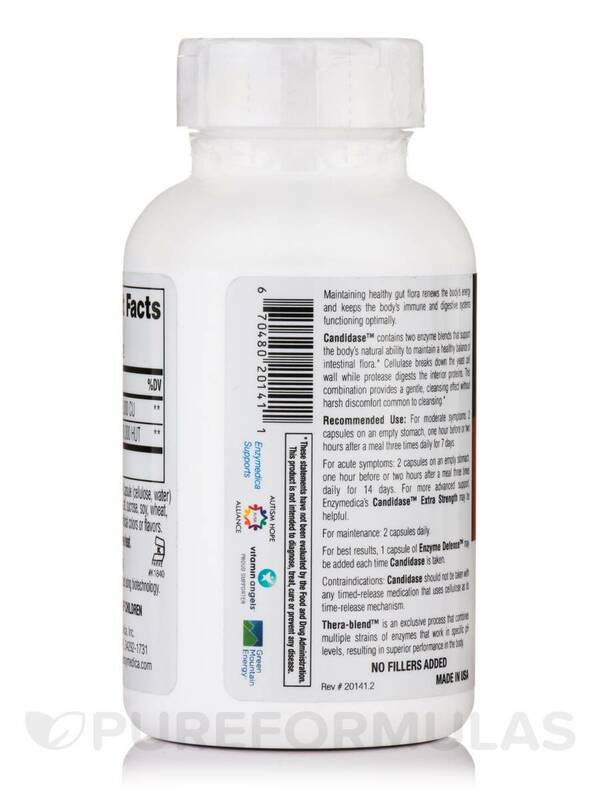 Candidase™ includes two enzymes that help control Candida overgrowth. In individuals with yeast overgrowth there is often a large amount of undigested fiber in the large intestine. Cellulase is the enzyme that breaks down fiber. It is also the only digestive enzyme our body does not make. By adding cellulase to the diet this fiber may be removed along with mucus and our body is able to achieve balance. The cell of yeast contains some fungal cellulose or a compound called chitin. Chitin is a polysaccharide‚ or carbohydrate‚ which is structurally very similar to cellulose. For the same reasons cellulase may help remove undigested fiber in the colon‚ it has been used in breaking down this cellulose-like chitin. The inside of the cell of yeast is mostly protein . The enzyme protease has the ability to hydrolyze (digest) protein. Protease has been used in clinics all over the world to break down this fungus and prevent its overgrowth. The addition of protease to this formula helps the body deal with excess "die-off" or common symptoms of cleansing. Other Ingredients: 100% VegeterianCapsule (cellulose‚ water). (Contains NO dairy‚ preservatives‚ salt‚ sucrose‚ soy‚ wheat‚ yeast‚ nuts‚ corn‚ cluten‚ casein‚ potaoto‚ rice‚ artificial colors or flavors). 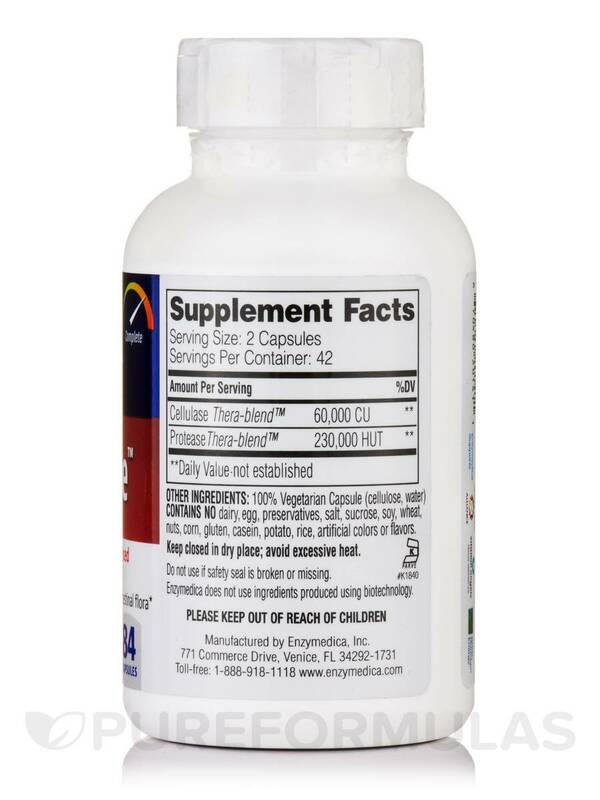 For moderate symptoms‚ take 2 capsules‚ 3 times per day at least 1 hour before or 2 hours after a meal for 7 days (for maintenance 2 a day). For acute symptoms‚ take 2 capsules‚ 3 times a day at least ½ hour before or 2 hours after a meal for 14 days. In extreme cases more time may be given. For best results 1 Enzymedica Virastop may be added each time Candidase is taken. 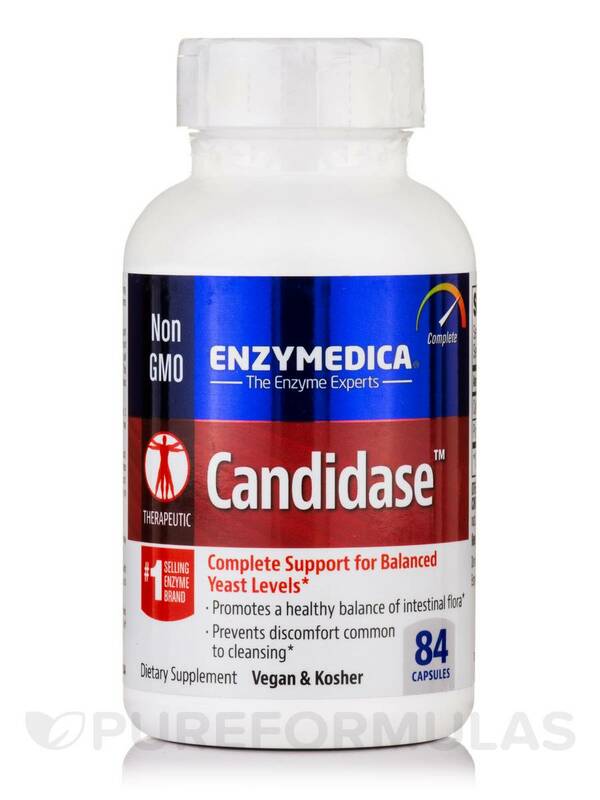 By far, Candidase by Enzymedica, is one of the best candida products I have ever used. Had great results with minimal die-off symptoms you get with other products. I will always turn to this particular product should the problem return. Great results without the typical die-off symptoms. Not that I disliked the product, but I recommend people start with just one capsule. 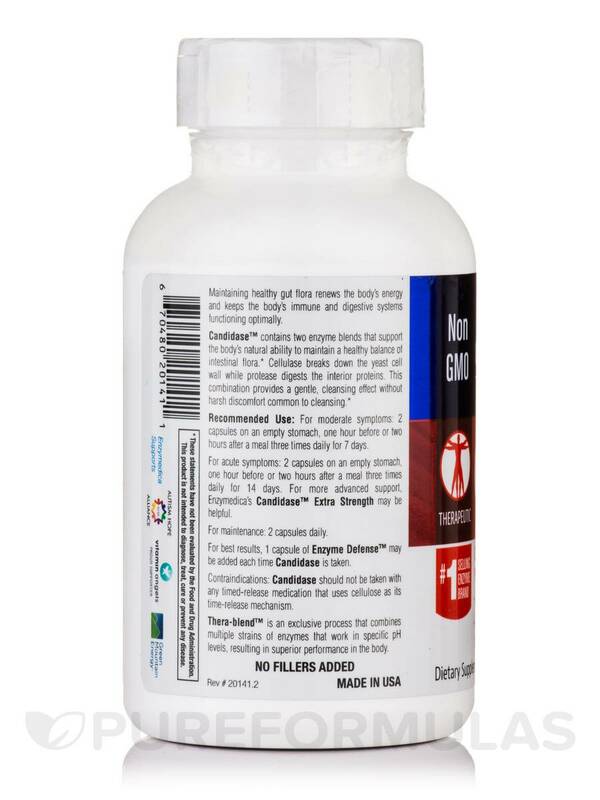 This product gets right to the job and the first time I took it I took two capsules which resulted in some very uncomfortable stomach cramping, etc. Once I dropped it back, no problem. 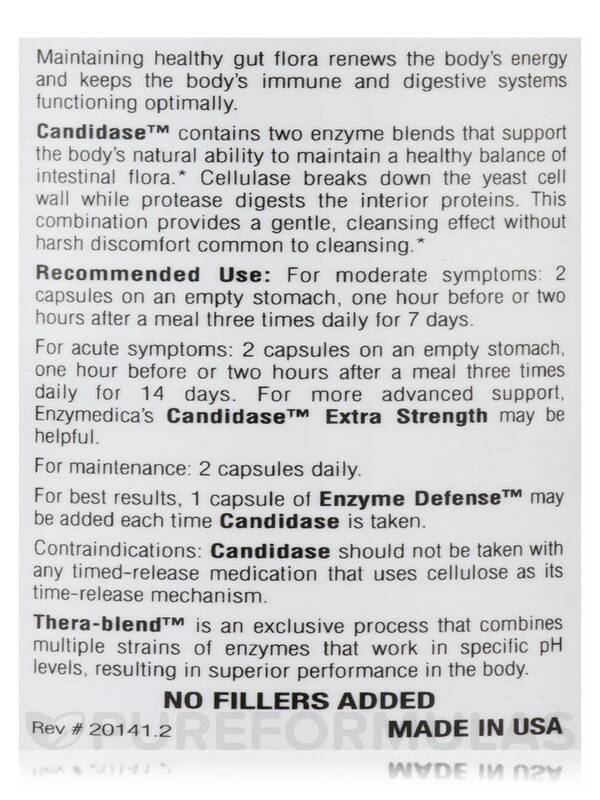 Candidase by Enzymedica is a good product and it seems to be working! 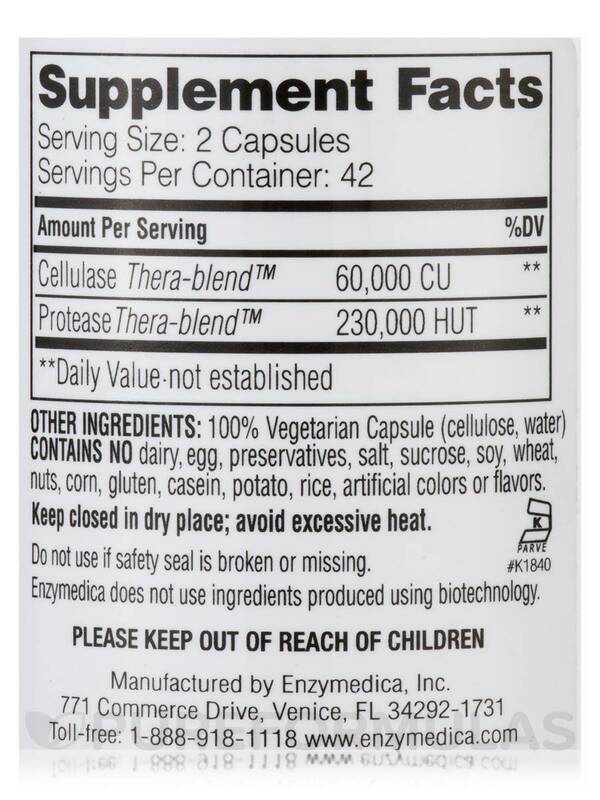 I have used Candidase by Enzymedica to treat my son for yeast overgrowth. I worked and was very mild. I didn't notice all the die-off symptoms you hear about with other products. He took it as directed and with a Digest Spectrum capsule. This was supposed to help with the die off, and it must have. He didn't have behaviours and discomfort I have heard reported when doing this type of treatment. Allergen free. It works! Easy and no discomfort. And made in USA. Candidase has really helped my digestion. Please tell me What color is the capsule? Hello, thank you for contacting PureFormulas. The color of the capsule is Beige.